The Poolside Cabana Party turned out great. Lots of those who would normally been there, had conflicts, but we had about 15 or so alums present…including some new faces. The weather could not have been more perfect for this outing! 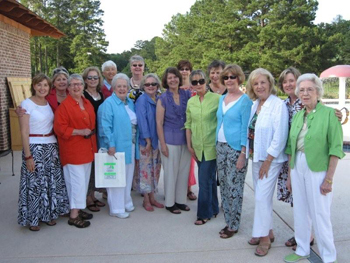 Several joined (and paid) our MS First Alumnae Association and others took the application with them to send in with their check. Everyone took a bag with our new logo home. The margaritas and appetizers were yummy and a good time was had by all. We had a board meeting today at noon to discuss officers for the upcoming year and to set a date for our annual luncheon which will take place at the end of this month. We also added some committees to help us function more smoothly.